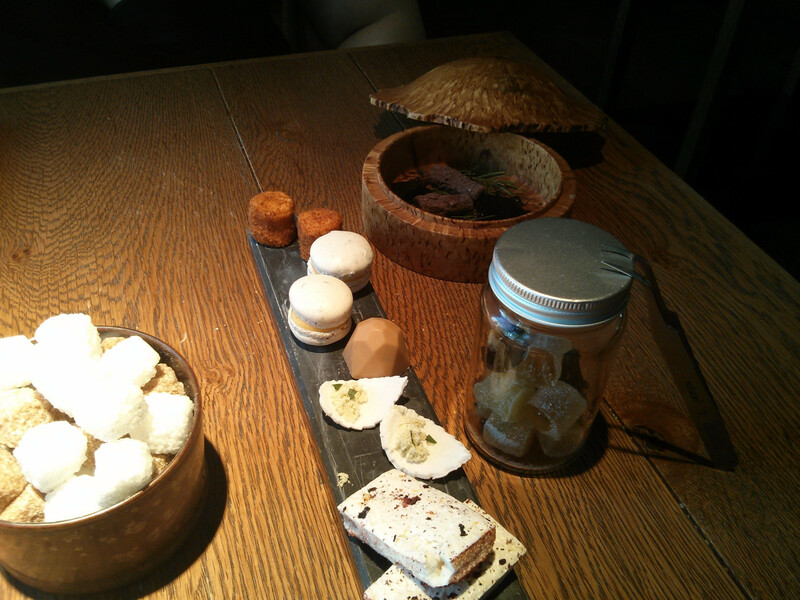 We returned to Tom Aikens Restaurant, this time sampling the tasting menu. The Amuse Bouche was interesting, a lettuce from their rooftop garden, with a truffle Caesar dressing and some extra truffle grated on top. 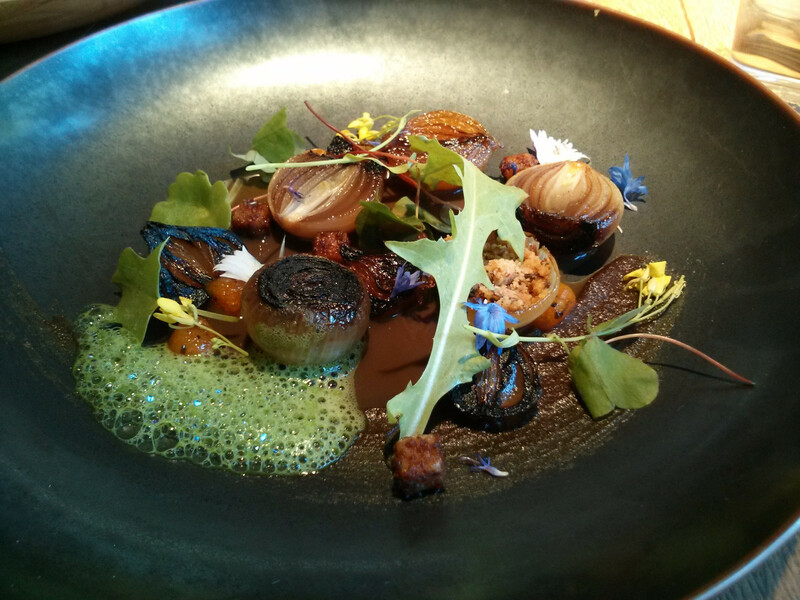 The lettuce was literally minutes from soil to plate and quite lovely, something a little different. 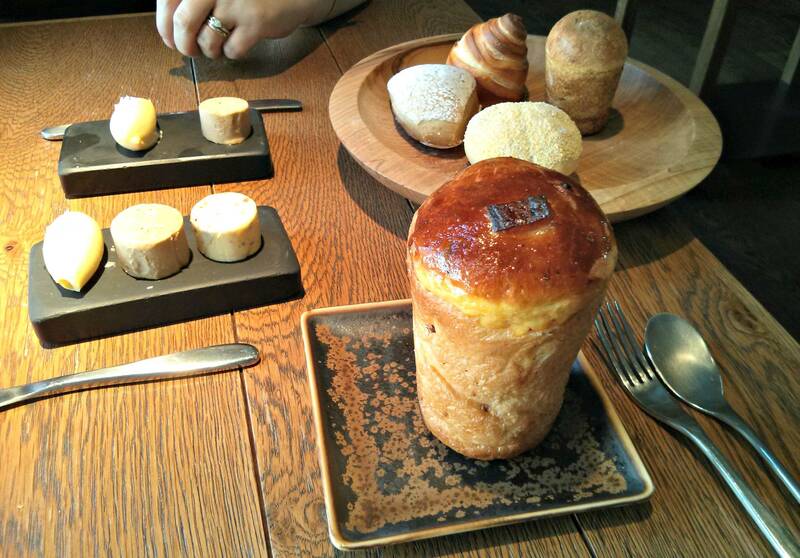 Bread was just as good as before, and that cep butter is still unbeatable. 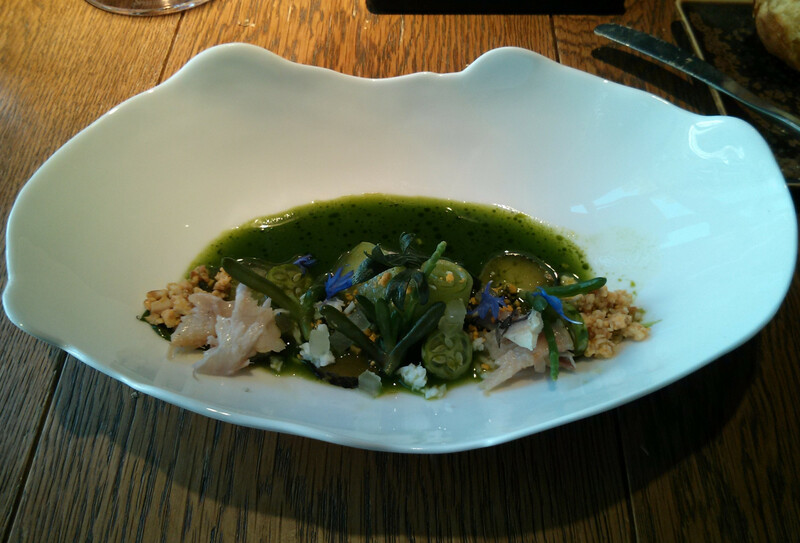 First course was an excellent smoked eel dish, with some variations of cucumber, sea veg and a watercress soup, light and refreshing. 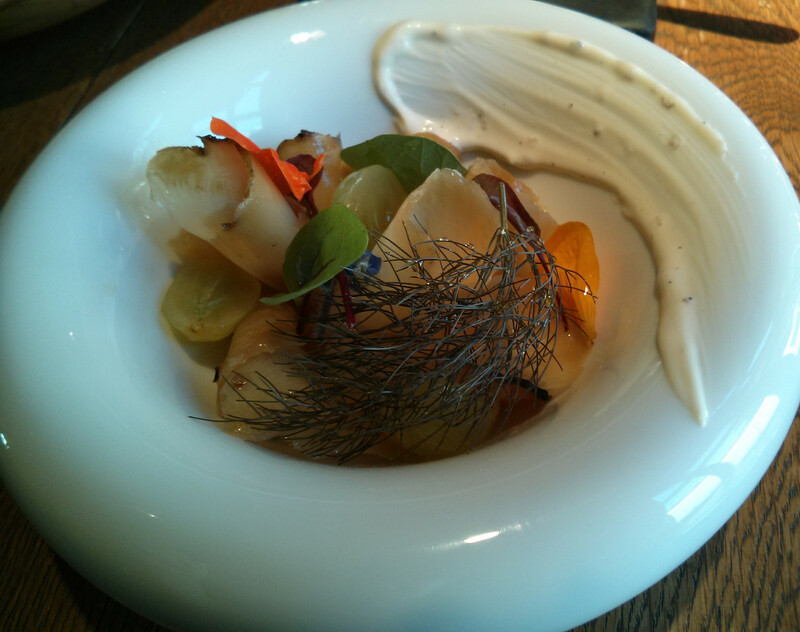 My wife had the celeriac dish from the previous visit, although a somewhat lighter balance of ingredients, reflecting the season. My next course was an ingredient you'd think would be too much on a hot day, foie gras. 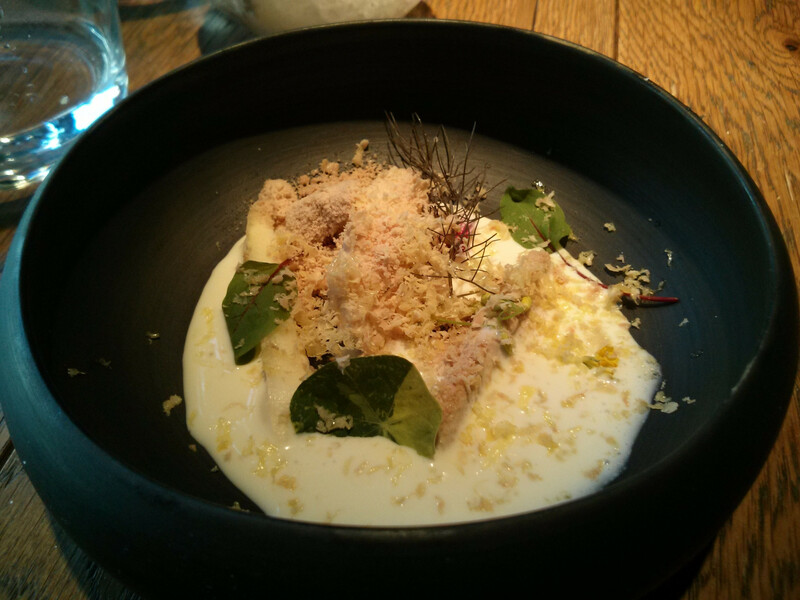 There was a small line of foie gras mousse, some freeze dried foie, white asparagus, nasturtium, white asparagus ice cream, and at the table, a white asparagus veloute was poured and then the dish topped off with some grated frozen foie gras at the table. This was cool and refreshing yet the frozen foie, mousse and dried granules melted in your mouth and add a deep rich flavour. The white asparagus ice cream and veloute was fantastic, the sweetness balancing perfectly with the richness of the foie. This has to be my favourite ever dish featuring this ingredient, everything worked so well together and was so delicious as a whole. 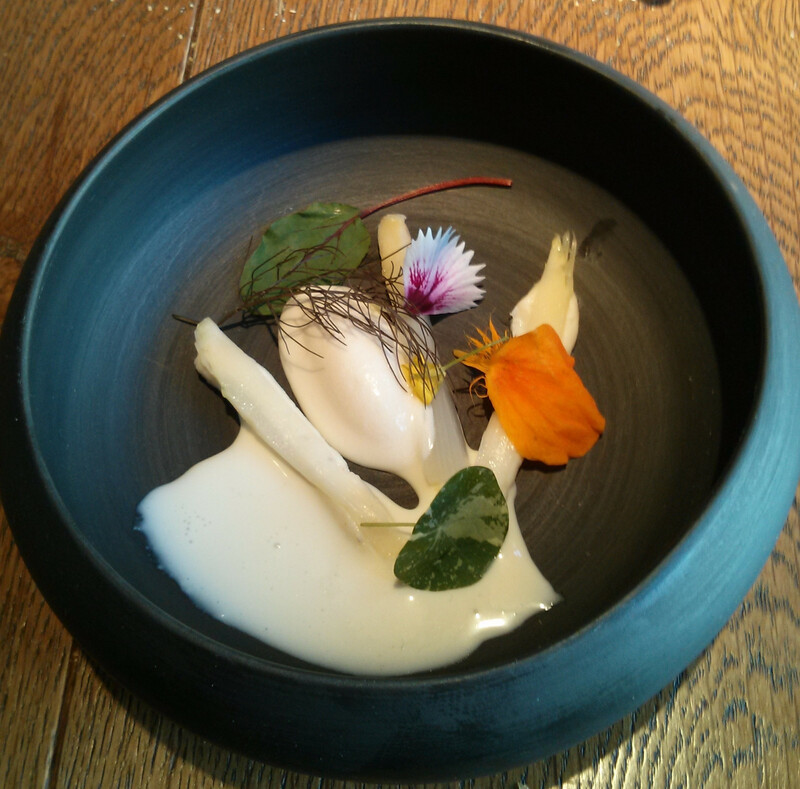 My wife's dish was the white asparagus elements, salad leaves and flowers. 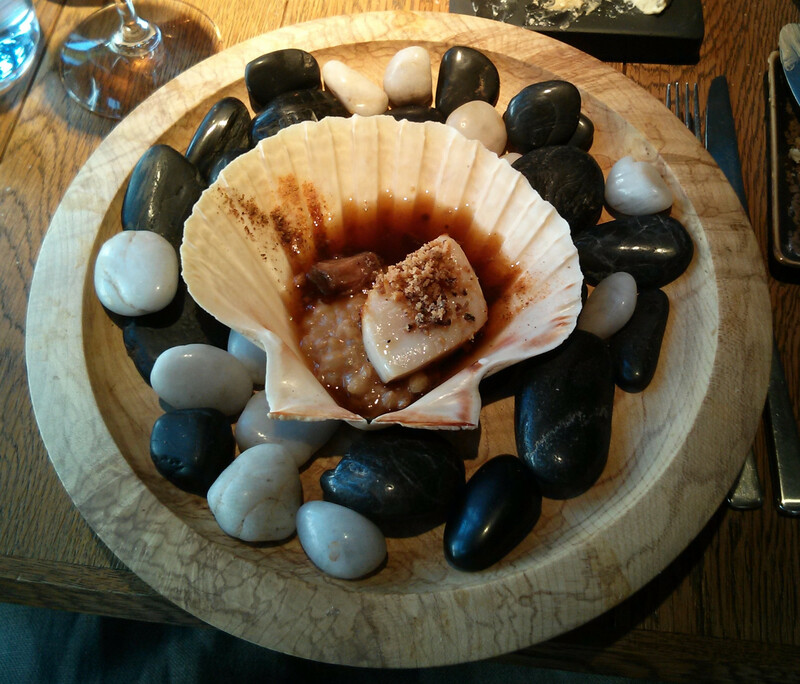 Following this a baked scallop presented in a bowl of pebbles. The scallop was a huge, an excellent example of its kind, and this was different from other scallop dishes I've had by the addition of yeast potatoes, a piece of osso bucco and some toasted bread soup, which made the dish quite savoury and meaty, an excellent dish. I do like the marmite potato too. 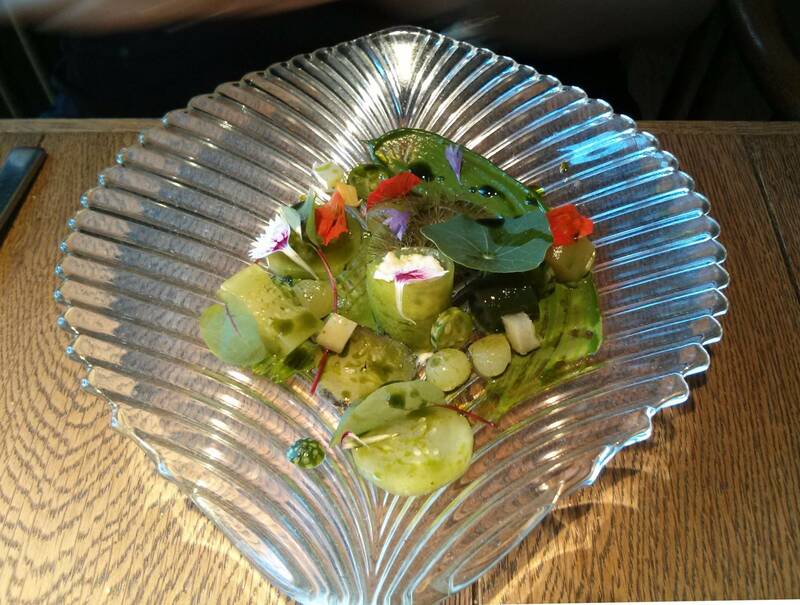 My wife had something similar to my first course, with various types of cucumber, pickled and salted, with some goats curd mousse, all lovely fresh flavours. We both had the same next dish, home made ricotta, this was sandwiched between what might have been milk skin, and came with some honey jelly, a ice cream and granita, olive juice, pine buts and basil. I was surprised how salty and strong ricotta can be, almost like feta this was lovely. The honey jelly was particularly good too. Following this my wife had a dish similar to the egg dish I had last time, a large fried ducks eggs, crispy breadcrumbs, but this time with onions too. The caramelised onion bits were really great. 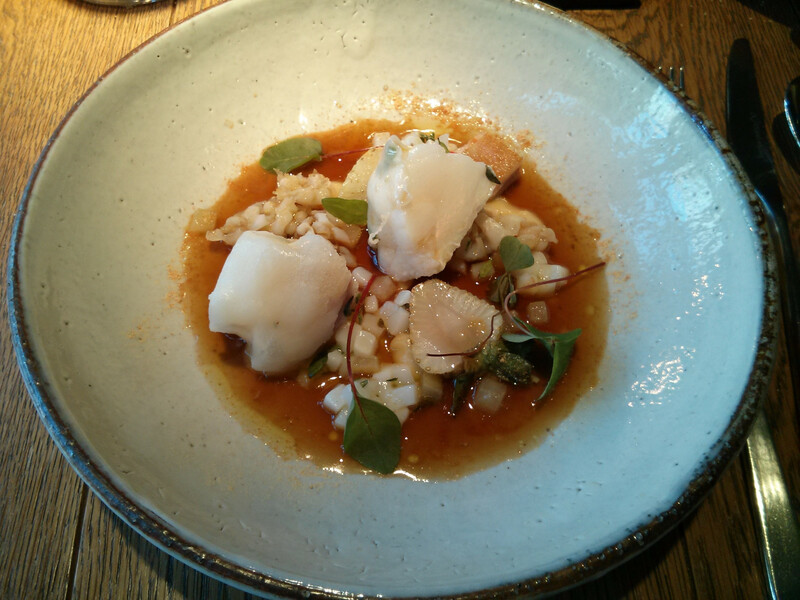 I had an unusual dish, monkfish tail, pork belly and squid, the unusual bit being the sliced white strawberries and small cubes of what might have been a citrus fruit or white strawberries again, adding a sweet and sour element to the dish. The fish, pork and squid were generous portions, with that rainbow sheen on the monkfish showing just how fresh it was with some perfectly timed cooking. The squid was lovely, soft and flavourful, the pork belly piece small enough to make me want to try the pork dish next time i return. The sweet and sour elements from the fruit just about worked for me, but strawberries and fish might not be for everyone. The final main course was the onion dish for my wife, there are some fabulous flavours here and excellent roscoff onions. I really like the sweet onion jam and burnt onion flavours in the piece I tried. 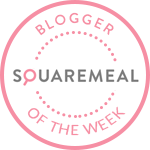 Lamb for me, a lovely pink well flavoured piece of fillet, with Mediterranean flavours from the olives, courgettes and artichoke accompanying it. The courgette and olive tempura thing was really good too. 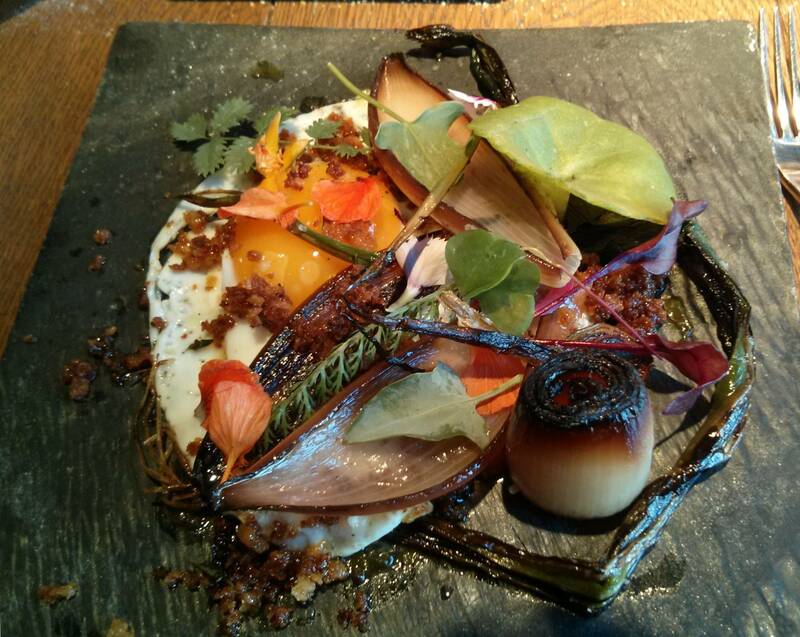 However, this and the fish course were almost full sized portions, as were the egg and onion dishes my wife had, we were struggling a bit by the end of the dish, nearing my limits for savoury food. Having said that, a short while later saw us clearing the plate of the strawberry dessert my wife had last time. It's just as well we have an additional pudding stomach. 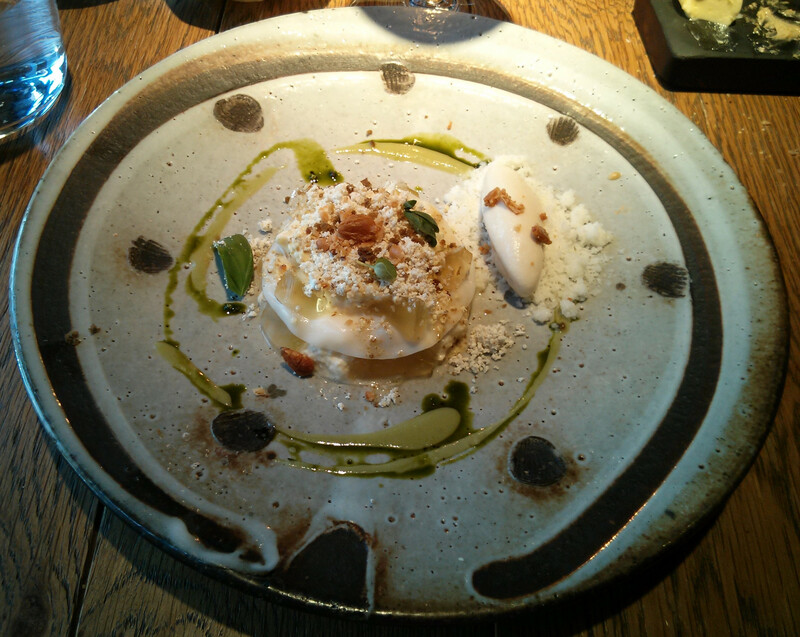 This is a fantastic dessert, lots of elements, all really great on their own or heaped on the spoon. 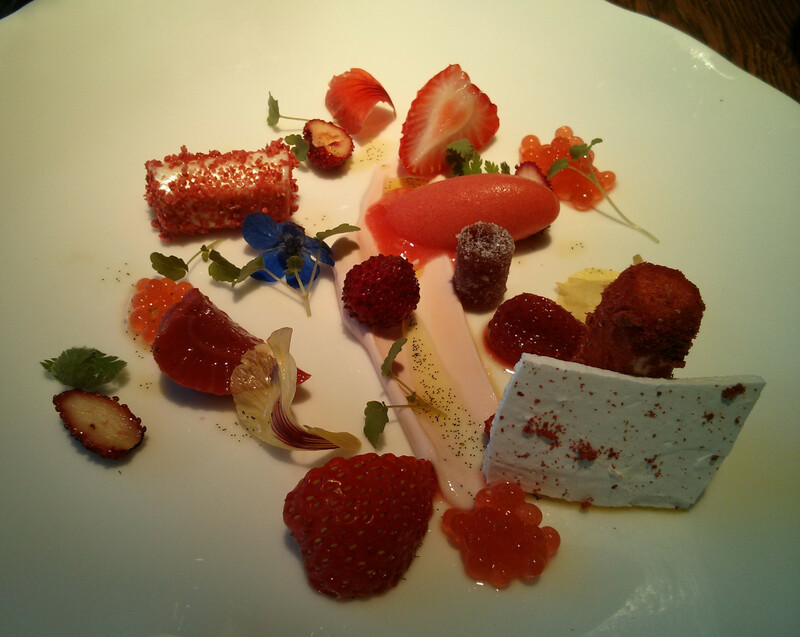 I loved the strawberry caviar and incredibly light melt in the mouth meringue piece. Petit four were as before, but with an extra truffle of caramac and coconut caramel, as good as it sounds. This is definitely one of the best petit four selections about, a huge selection to be had. However, as we didn't check or weren't told if the jellies were gelatine free I had to eat them all myself. I'd recommend vegetarians check first, and to be honest the other pieces on offer are so good, extra instead of the jellies wouldn't be a loss. I really enjoyed the meal, and was full to bursting, one wafer thin mint short of a Mr Creosote impression when we left, modern fine dining is not always so generous as this tasting menu. 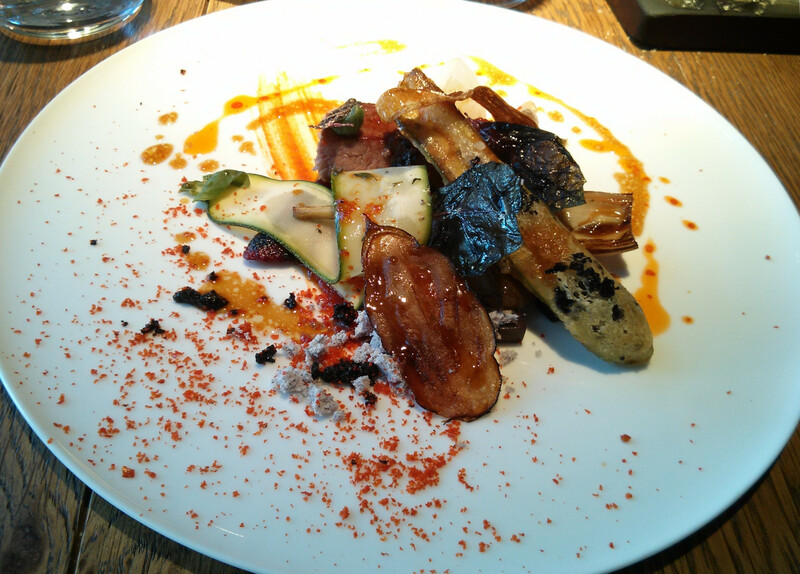 There were some really good dishes to be had, and that foie gras dish as good as anything I've had this year. The bill came to roughly £260.